Greenhouses are very beneficial for the serious gardener who doesn't want to worry about weather elements--especially if you are growing a sensitive crop like tea. A greenhouse can maintain humidity for tea plants, provide lots of sunshine and protect them from cold temperatures. Growing tea in a greenhouse also gives you the benefit of raising plants to be used as "parent" plants for the next season, and increasing your overall harvest of green tea if you are trying to grow large amounts. According to the Greenhouse Gardener's Companion, greenhouse tea plants will not grow as tall as outdoor tea plants because the environment is more restrictive. Ensure that your greenhouse has proper ventilation, as tea plants need consistent air circulation. Spread them from each other so they are not too jammed together, and the air can flow through them evenly. Use your ventilation system (the type depends on your climate and greenhouse size), or open the greenhouse doors from morning to afternoon so air flows in and out of the structure. To cool the greenhouse, hose down the floor and open the ceiling vents for evaporation to cool off the tea plants. Start your tea plants from cuttings or a transplant from a local nursery; this is quicker and simple than starting from tea seeds. Cuttings are obtained from tea plants that are already growing. Prepare your soil by mixing two parts soil to one part sand. Tea thrives in sandy soil because it provides great drainage, keeping it damp but not wet. Add this soil mixture to your planter pots, filling them up to the top. Plant your transplants or cuttings, which is pretty much the same process. Set the tea transplants or cuttings into a shallow hole (either the size of the root ball or the cutting) and then lightly cover with about 1 1/2 inches of soil. Water the soil thoroughly with room temperature water. When plants become accommodated to consistent greenhouse temperatures, water that is too cold or hot can shock the plant and kill it. Tea plants love soil that is consistently damp, but make sure you do not over water. In a greenhouse tea plants won't need as much water as they would outdoors. Water when the first 1/2 inch of the soil is dry. Drip irrigation systems are ideal for larger crops. Keep your tea in full sunlight. Add compost to the soil around your tea plants. You do not want to use any sort of pesticides or chemical fertilizers, since tea is an edible plant. Add things such as compost, vegetable scraps, egg shells or coffee grounds. When plants are grown in a greenhouse, they can miss out on nutrients that they would gather from the natural outdoors. Adding compost to your tea plants will help make up for that. Harvest tea leaves once the plant is full and bushy, but his usually takes a couple years. 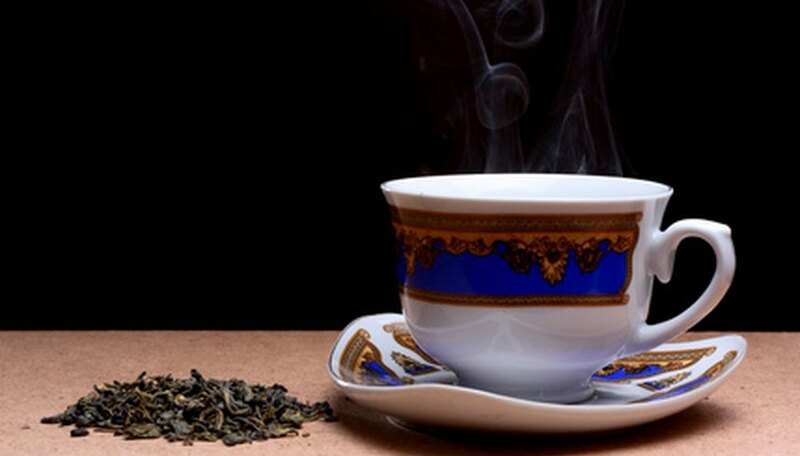 Young tea leaves have mild flavors; the older the plant, the stronger the flavors. Pick off the tea leaves at the plant's base.